To start a corporation in Mississippi, you must file Articles of Incorporation with the Secretary of State’s Business Services. You can file the document online or by mail. The Articles of Incorporation cost $50 to file. Once filed with the state, this document formally creates your Mississippi corporation. However, to actually ready the corporation to do business, you must complete several additional steps. Mississippi Articles of Incorporation must be completed in the state's online portal and then submitted or printed and mailed. Our free account and tools will walk you through starting and maintaining a Mississippi corporation. All for free. 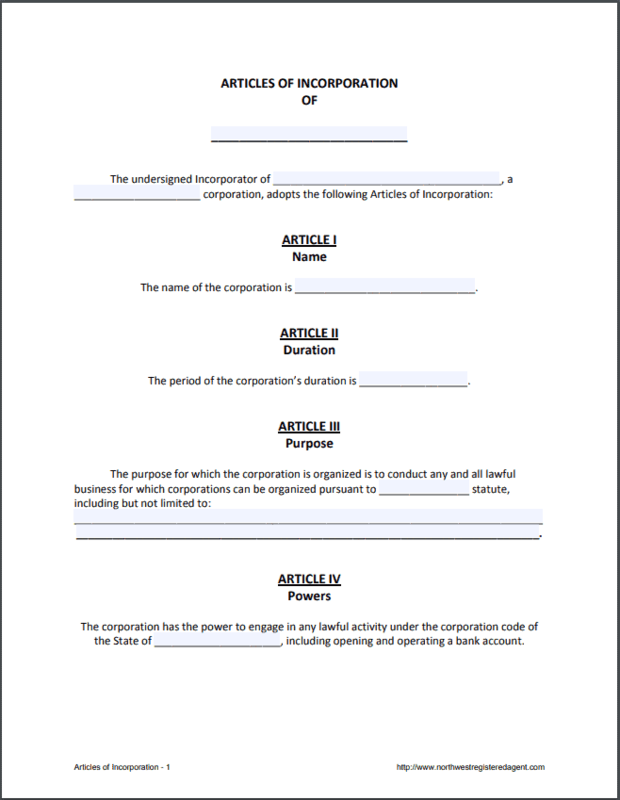 To form a Mississippi corporation, you must complete and file the Articles of Incorporation with Business Services. The document is an example form only—Mississippi requires all filings to be done online. The requirements for online filings are explained below. If filing yourself, you must first create a Mississippi Corporations Registered Filer account (even if you plan to submit via mail—paper forms must be first completed online, and there’s no access to the online forms without an account). You’ll need to provide your name, address, phone number and email to create an account. Tip: Avoid all these extra steps when you hire Northwest. Just answer a few questions, sit back, and let us file everything correctly the first time. This is where the Secretary of State will send any official notifications. Like everything in your Articles of Incorporation, the email you include here becomes part of the permanent public record of your corporation. Avoid an inbox full of spam and use our email when you hire Northwest. If want your Mississippi corporation to begin right away, you can skip this section. If you’d prefer to begin on a specific day (maybe to line up with the beginning of a tax period), you can enter an effective date up to 90 days in the future. Tip: Most corporations skip this section. Want your business to continue indefinitely? Skip this section. Prefer to put a self-destruct timer on your business? List the number of the years you want your Mississippi corporation to exist. Tip: Most corporations skip this section as well. For each stock class, list the number of shares you’d like to create. You must have at least one share. Select at least one NAICS code—these are 6-digit codes for nearly every sort of business activity you could think of. Pick the best match for your business (it’s okay if it’s not a perfect match). From the drop-down menu, choose either “organization” or “individual,” and list your agent’s name. Tip: For expert registered agent service, we recommend Northwest. Your incorporator electronically signs and submits your Articles of Incorporation. You incorporator must enter their name, address and title (it doesn’t have to be a director or officer; you can simply choose “incorporator”). Tip: We’ll be your incorporator when you hire Northwest. How much does it cost to start a Mississippi corporation? The state charges a $50 fee to submit Mississippi Articles of Incorporation. If you submit your filing online, there’s also a variable convenience fee that’s around $3-4. Hire Northwest to form your Mississippi corporation and your total out-the-door cost is $278. This includes state filing fees, a full year of registered agent service and all the business documents you need to open a corporate bank account. How long does it take to start a Mississippi corporation? Mississippi Articles of Incorporation must be filled out online and then either submitted electronically or printed out and mailed. The processing time is quick—just a day—but if you mail your form, you’ll need to add time for postal delivery. If you hire Northwest to start your corporation, we file online and typically have your Mississippi corporation formed within 24 hours. Does a Mississippi corporation need a registered agent? Yes. In your Articles of Incorporation, you’re required to list a Mississippi registered agent. You can either hire an agent or appoint someone. You can even appoint yourself. The job, however, comes with more headache than many people anticipate. You have to list the address where you’ll be available—and this address becomes part of the permanent public record for your corporation. A public address can mean loads of junk mail and unwanted visitors on your doorstep. Additionally, you have to be regularly available at your address during business hours. When you have meetings to attend and errands to run, being tied to your desk can be tough. A better option? Consider hiring a commercial registered agent service like Northwest. When you sign up for our services, you can maintain your address privacy with our registered office address. We’ll accept, scan and send you any service of process the same day. You can stay on top of your business, wherever you are—whether that’s sitting in a board meeting or fishing the Gulf. Yes, creating bylaws is crucial to the organization of your Mississippi corporation. While public documents like your Articles and Annual Reports form and maintain your corporation in the state, your bylaws determine how your corporation actually operates. Your bylaws answer questions about how corporate decisions will be made and who gets to make those decisions. There’s a lot to consider: How will board members be selected? How long will their tenure on the board last? How many members of the board will be required to vote on a resolution? Who will be officers? What duties and authority will they have? Which types of stock will have voting shares? These decisions will significantly affect your corporation, your officers and shareholders, and even your business relationships. Whether you’re opening a corporate bank account, taking on partners, or seeking investors, the people and businesses you work with will want to take a look at your bylaws. Creating bylaws isn’t easy—which is why Northwest gives you free corporate bylaws when you hire us to form your Mississippi corporation. We know what kinds of topics and questions corporations need to address, and we’ve spent years refining and improving our forms. We give you other free corporate forms as well, such as resolutions and meeting minute templates. Let us help you start out on the right foot. Check out the free corporate forms we provide to help corporations form and maintain their businesses. Yes, corporations must have an EIN for their federal tax filings. You’ll also need your EIN in order to register for Mississippi’s Taxpayer Access Point, the state’s online tax system. You can fill out the IRS’s application yourself for no cost, or you can save yourself a few steps (and some headache) and hire us to get your EIN for you. No extra application or form is necessary—just add on EIN service during checkout when you hire Northwest to form your Mississippi corporation. Does a Mississippi corporation need a business license? There isn’t a general, state-level business license in Mississippi. Cities and counties, however, may have their own licensing requirements. For instance, many cities, including Jackson, Southaven and Meridian, require business or “privilege” licenses. Fees are variable (often depending on factors such as number of employees and inventory) but typically start out at $20. What is a Mississippi Annual Report? Your Mississippi Annual Report is a form you file to confirm or update your corporation’s ownership and contact information with the Secretary of State’s Business Services. The report and $23.25 fee must be submitted by April 15th each year. Fail to file? The state will dissolve your corporation. Yikes. Northwest can help you ensure you remember your filings and stay compliant. When you hire us as your registered agent, we send you reminder notifications for your reports. Better yet, put your mind completely at ease and hire us to file your Annual Reports for your Mississippi corporation each year. How much does a corporation in Mississippi cost each year? $23.25. This is the filing fee for the mandatory Mississippi Annual Report. What are the taxes for a Mississippi corporation? Some good news—over the next few years, Mississippi is in the process of phasing out the 3% bracket. By 2022, the corporate income tax will exempt the first $5,000 of taxable income. Mississippi also has a corporate franchise tax that applies to both C and S corporations. The tax is $2.50 per $1,000 of either capital employed or assessed property value in Mississippi (whichever is greater). There’s a minimum corporate franchise tax of $25. The state sales tax is 7%, but cities can choose to tack on up to 1% additional sales tax. For example, customers will pay 8% at the counter in Jackson, 7.25% in Tupelo and 7% in cities like Gulfport and Hattiesburg.